A new boss has landed in our event, Lord Montymort, and people are asking how to defeat him, and why the quest seems stuck. Join us right after the jump to see how it works! 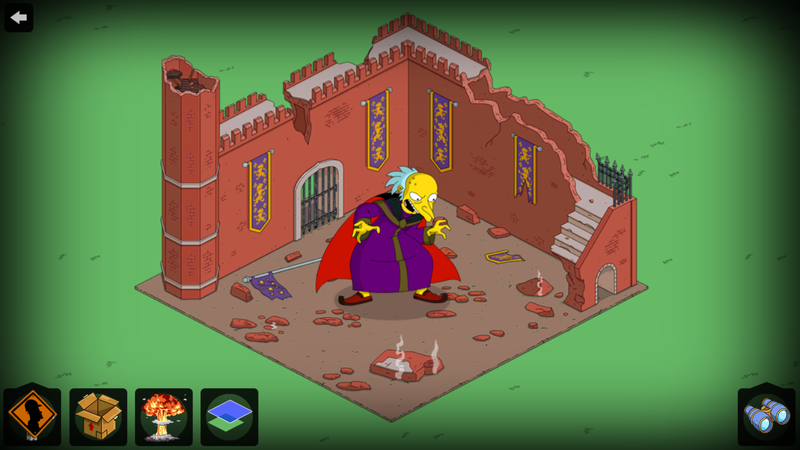 and doing Lisa and Homer’s jobs, The Vestige questline starts, with Lord Montymort appearing on the ruins. Pt. 1 involves sending Springfielders to duel him. By tapping the event icon on bottom right, on the left you’ll see a new icon, . By tapping it you’ll be brought to a new screen, where you can assign Springfielders to fight him. Like the other monsters, you can have characters attacking him. 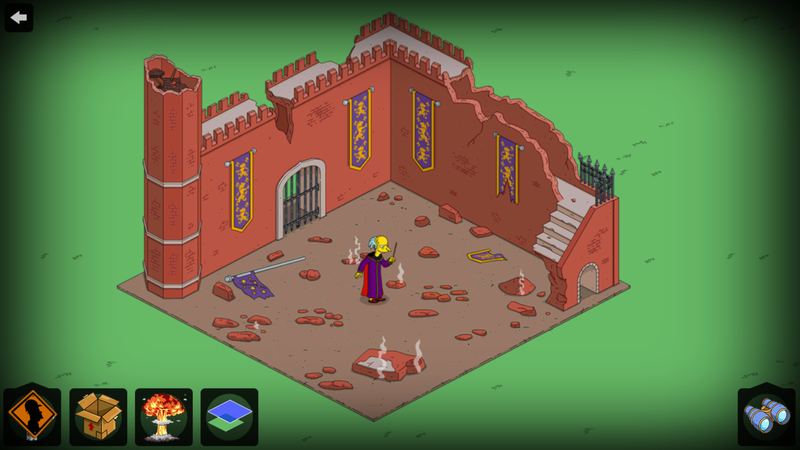 Wizard Lisa, Wizard Bart, Magic Act Milhouse, Unicorn Wizard and GreyStash will deplete half of a heart. 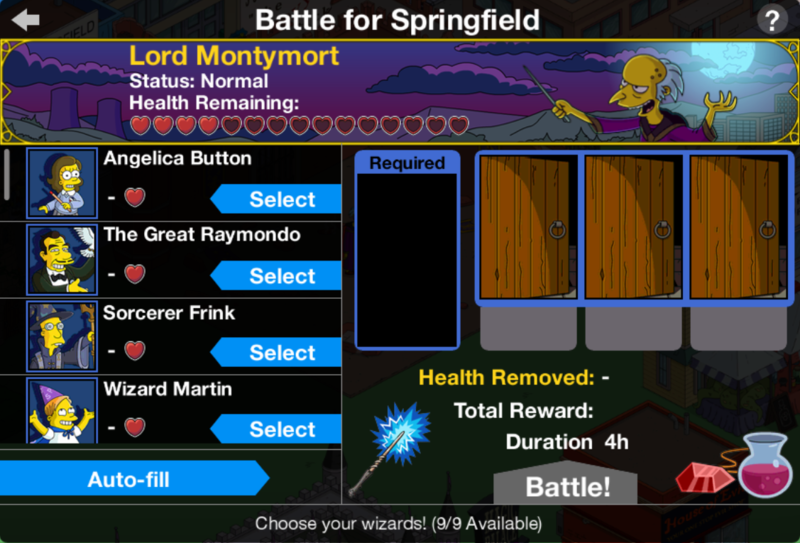 Wizard Martin, Angelica Button, The Great Raymondo and Sorcerer Frink will deplete an entire heart. After the entire bar is depleted, Pt. 2 will start, involving the monsters you’ve captured and enchanted this time, to fight his bigger form. Kearneymon, Lewd, Crawl, Bully-Vern and Barfy will deplete 1 heart. Wiggops, Treestache, Burns Dragon will deplete 1 and a half heart. 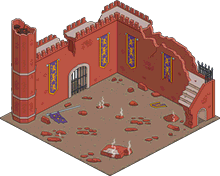 The monsters need to be fully captured and enchanted before they can fight him. Once the second bar is depleted, Lord Montymort will be defeated and resting. After 4 hours, he’ll regain all his health. At this point Pt. 3 will be active, where you’ll have to Defeat Lord Montymort 3 times. The process described above will have to be repeated three times. 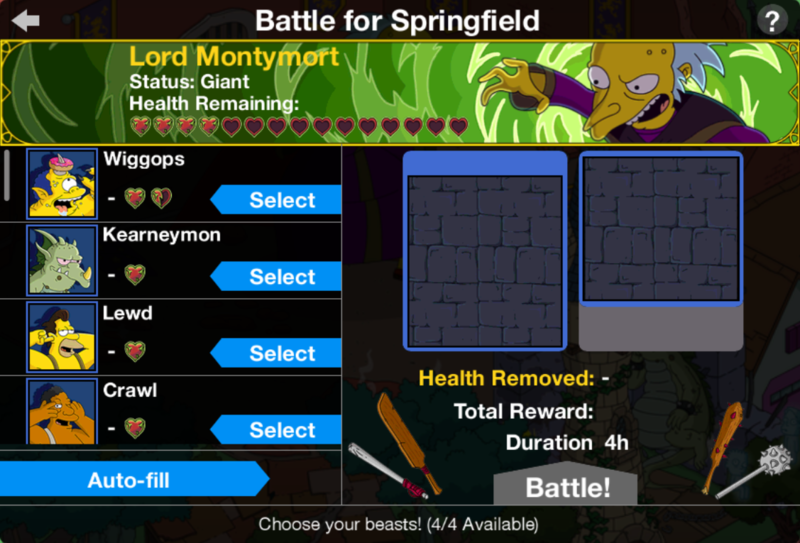 After completing all 3 battles (for a total of 4), Lord Montymort will be unlocked for good. Please help me, I reveived no answer. 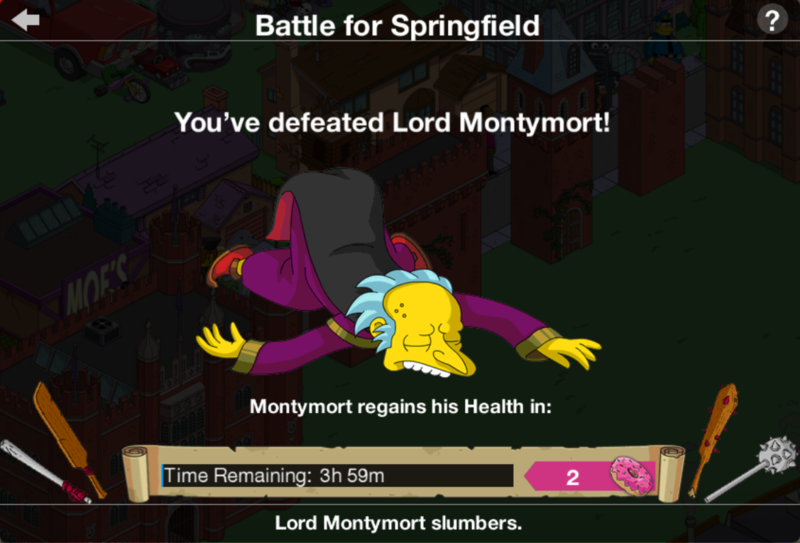 In my Springfield, Montymort is now serving his first life sentence 24 hrs (he served 8 hrs before, now it’s 24). Is this already the bonus round or do I need to complete this task (24 hrs)? I ask because this 24 hour task that the game asked me to do (it’s called “Lebenslang für den Zauberer – Teil 2” which could be translated to “lifelong for the wizard – part 2”) lasts longer than the event. Is this the bonus round and if so, what can I win during it? “Only” donuts or some event / limited time content? This task ends 3 hours AFTER the event ends so I’m wondering what happens once the event is over and Montymort is still not finished with this 24 hrs task. Could I miss some event content? 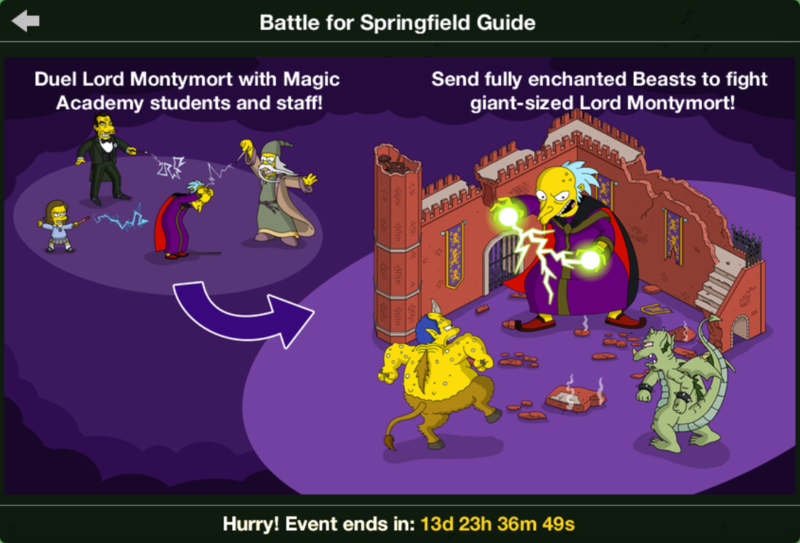 Or are Montymort and Dracula definately the final prizes? Or does finishing this 24 hrs task give me event currency? Please help, time is running out. 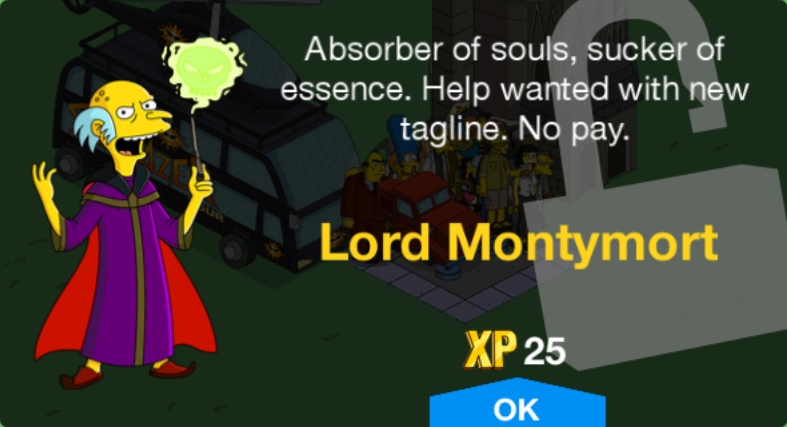 Can we still try to get Lord Montymort after the event is over? I just got enough currency to win Dracula …but I can’t find him..the icon for the event says I have him but the characters list still shows him graded out…I tried hard close and resynching but still nothing. Any ideas? Question. If i buy the magic mystery box and get Squirrel Luann costume, do i get her since i dont have her, or do i have to wait to use it when i eventually unlock her? IMO Alex, Luann is one of the best premium characters you can buy. She has a fairly involved story line with Kirk & Milhouse, but also triggers the Investorettes story line with Marge & Mrs Skinner which is quite involved too & allows you to purchase Fleet-a-Pitta trucks which you can’t buy otherwise. Finally the cracker factory that comes with Luann brings with it a Premium paying 8h job for Kirk. I don’t know if I’d bother getting the Squirrell outfit for her though, since she is already a premium character there’s not much to be gained from it. I’ve defeated him with the monsters and he “recharged” for the 4 hours or whatever time it took. I go to try and send characters to battle him again and it says done but won’t let me click on it. It’s like it’s stuck. So he’s just hanging out but it won’t let me battle him again. What do I need to do? did you try sync by going to krustyland/friend screen? 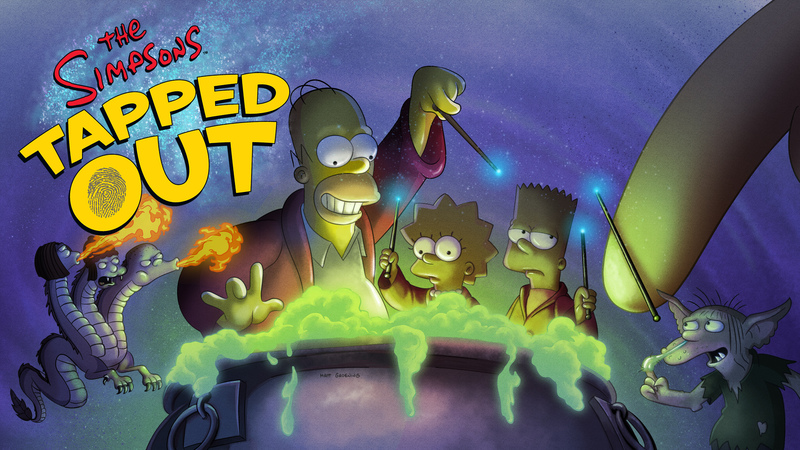 Next Treehouse of Horror XXVIII: New and returning items in the store!